Shagya Arabian horses were developed in the Austro-Hungarian Empire during the 19th century at the Bábolna, Mezohegyes, Radautz, Piber, and Topolcianky stud ranches. Today can be found in Slovenia, Austria, Croatia, Serbia, Romania, Poland, and Czech Republic. Shagya Arab horses originated in Hungary and were developed to create a much taller and sleeker version of the traditional Arab styles. 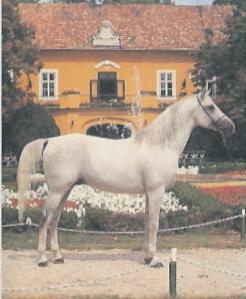 One of the major founding sires was Shagya (hence the breed’s name), a gray Arabian (or perhaps part-Arabian) stallion with some ancestors of the Kehilan and Siglavy strains. Born in Syria in 1810, he was taller than the average Arabian of the time, standing 15.2 1/2 hands (62.5 inches, 159 cm) at the withers. Shagya was used mostly for crossbreeding at Babolna, bred few pure-blooded or asil Arabian mares. Many of the Arabian stallions standing at Babolna and other studs were crossbred with mares who already possessed a great deal of Arabian influence due to the long Turkish occupation of Eastern Europe. Some Thoroughbreds and Lipizzans were also used. In all cases, meticulous pedigree records were kept. There it would go on to provide an attractive appearance as well as a very gifted athletic performing horse. They became a very loyal and swift moving creature, great for use as a carriage horse for their style and also for harness work. Once famous for being a sport horse, they took over the dressage categories, even wining an FEI championship in Babolna. Shagya Arab horses have a distinct cream colored coat. They are tall (around 16 hands tall). They are strong willed and extremely brave, but not to the extent that they need to be monitored for it. They are equally known for their friendly demeanors as they are for their inner strength. They do well around people and love attention.